He’s been SO keen to try new foods that I figured it was time to move on from the frittata fingers and experiment with something new! He’s literally been watching EVERY single little thing that we put into our mouths. And I mean EVERYTHING. It’s actually really cute how fascinated he is. The other day, he was staring down my hubby as he ate his chicken sandwich and he watches me like a hawk everyday when I eat my oatmeal or drink water from my big pink cup. Now that he’s officially ready for solids, my main goal has been to try wherever possible to feed him what we’re eating (with minor modifications, of course) to promote that all important family meal time, model healthy eating behaviours and limit the additional meal preparation. I’m determined to NOT have to make the kid separate meals! Last week, we had some extra salmon in the fridge. I was pondering what to do with it, so I decided to experiment with some mini salmon cakes for dinner. I figured since salmon is one of my favourite foods, Leo might as well get used to eating it since it’s such a staple in our house. 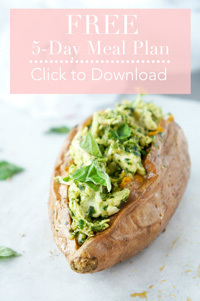 Plus, my husband and I could eat it for dinner too, which meant less meal prep for me! 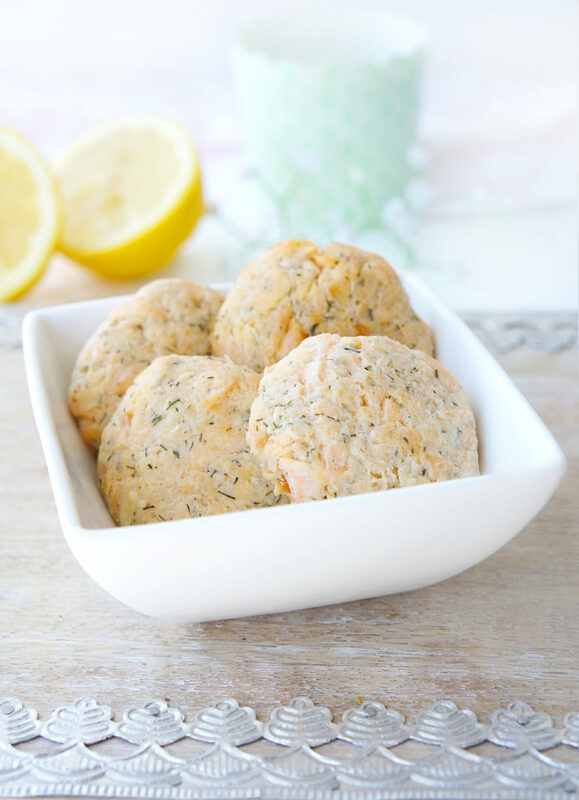 When brainstorming first foods to try out with Leo, I thought these mini salmon cakes would be a great way to add some extra iron to his diet (plus, it has the vitamin C from the lemon juice…BONUS)! A good source of omega-3s, particularly EPA and DHA. EPA and DHA are especially beneficial as they support a healthy heart, brain and cognitive function, joint mobility, eye health, healthy skin and hair, and a healthy immune response. These essential fatty acids are so important for both little ones and adults! 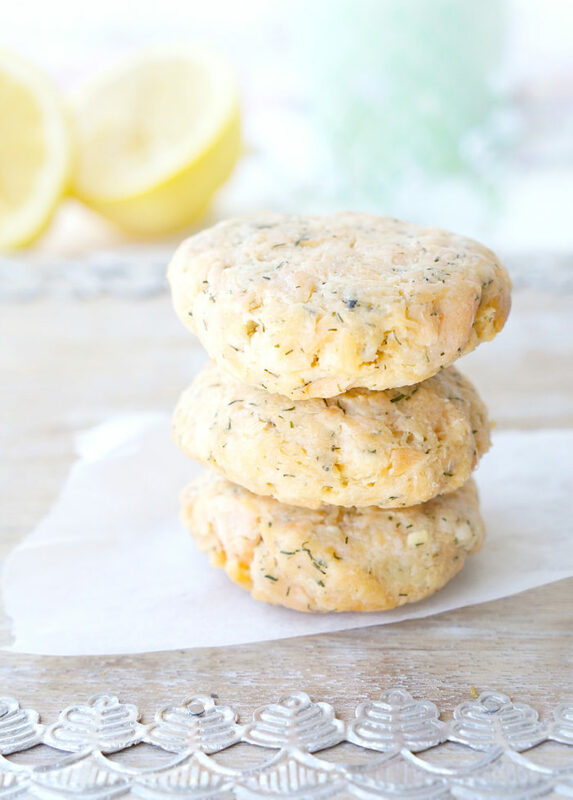 Rich in other nutrients – Salmon is a great source of protein (with 7 grams of protein per mini cake), vitamin B6 and B12, vitamin D and selenium! So much nutritional goodness packed into these little cakes. Perfect size for little hands – This is the PERFECT recipe for little ones since the cakes are so easy to hold and fun to eat! Easy to eat – The salmon is chopped up so finely that it makes a great soft food for little ones just starting out on solids, even if they don’t have any teeth. Just make sure you pick out any bones! 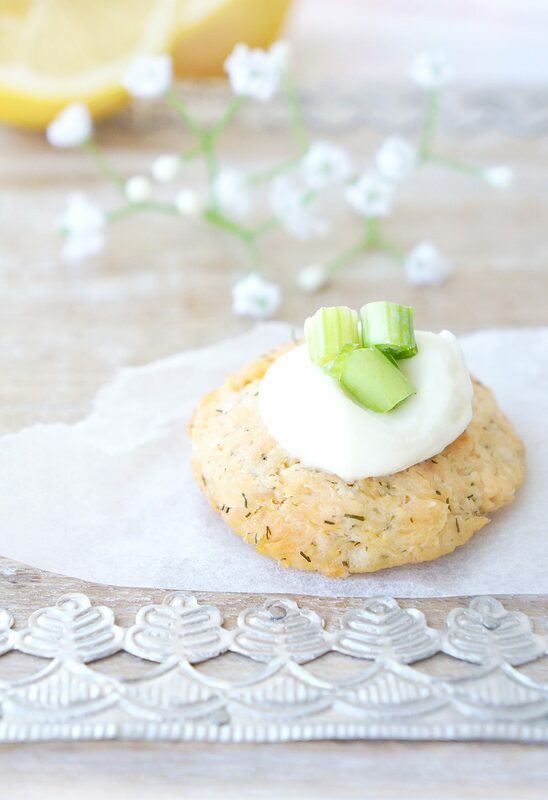 Dippable – Although tasty alone, dipping the mini cakes in this roasted garlic spread is highly recommended as it kicks the flavour up a notch! 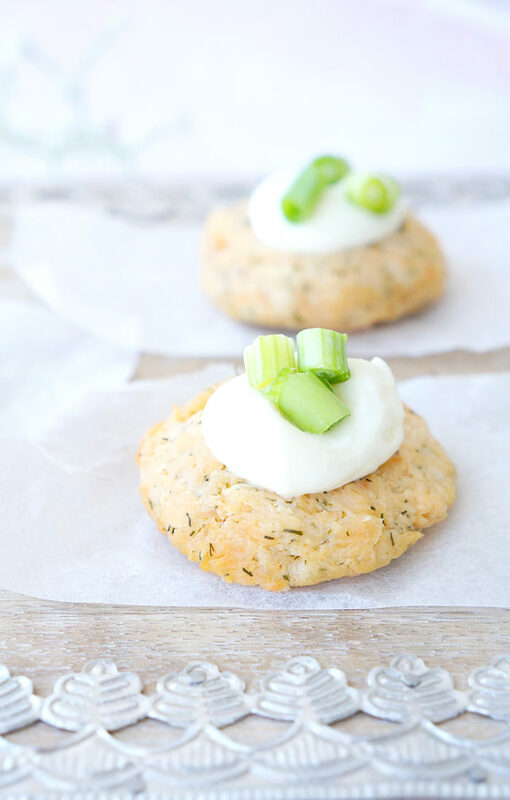 So many reasons to LOVE these mini salmon cakes! What are some of your favourite foods to feed to little ones? Preheat the oven to 350 F. Bake salmon for 20-25 minutes or until it flakes. Allow to cool enough to handle. In a medium-sized bowl, flake the salmon using your hands or a fork. Mix in the almond flour, eggs, dill, lemon juice, garlic cloves, Dijon mustard, and salt (optional - see notes below) until well combined. Using your hands, press mixture for adults/older children together to form approximately 16 circular patties. ** Place on parchment paper-lined baking sheet. Bake for about 15 minutes. Carefully flip the cakes and bake for an additional 5-10 minutes or until slightly browed on each side. 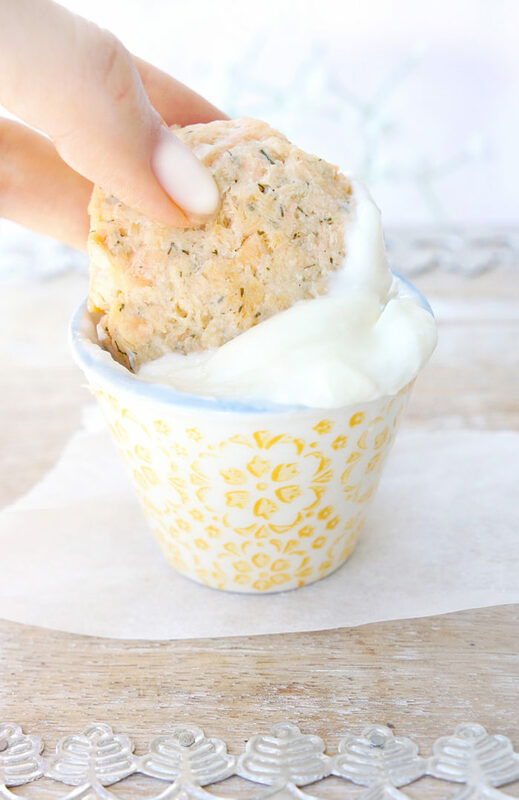 Serve salmon cakes on their own or along with the roasted garlic spread. * If making cakes just for baby, it is recommended that you leave out the salt to limit sodium intake. If adults or older children are sharing the cakes with baby, divide the salmon mixture in half and place in two separate bowls. In the portion for adults and older children, add salt if desired and mix until incorporated. ** If making recipe for baby and adults, using your hands, first press mixture for adults/older children (with extra seasoning) together to form approximately 8 circular patties. Place on parchment paper-lined baking sheet. Next, form the baby's mixture into an additional 8 circular patties and place on the other side of the baking sheet, paying attention to which patties contain the extra flavouring (you can even label the parchment paper to help you remember). You can freeze any extra cakes in the freezer between parchment paper in a container or a Ziploc bag.